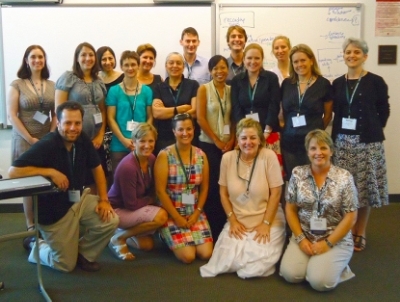 For the 2010-11 IBSC Action Research Project, there were three research topics: Languages, Libraries, and Leadership. How can boys' engagement and achievement in the study of Foreign Languages be developed and enhanced? The research literature suggests that in general boys are less likely than girls to enjoy and find success in Foreign Language study. But we know that boys’ schools can give opportunities to capture boys’ interest and motivation, and lead them to success and achievement in the study of languages. This global action research team examined ways in which boys' engagement and achievement in the study of foreign languages might be developed and enhanced. A team of 15 researchers from around the globe worked on a variety of exciting projects teaching foreign languages including French, Spanish, German and Japanese. Several of the projects examined different uses of technology such as using Rosetta Stone, Lingt Language, Bon Patron, Voicethread, and participating in an online classroom. Others examined innovative approaches such as using an outdoor classroom, introducing kinesthetic activities, using a weekly silent reading period, using artworks, culture, role-play and directed dialogues, rhythm and music, and the recording of original songs to teach foreign languages. Review the Action Research Language projects. How can school library programs and initiatives support and enhance boys' enthusiasm for and success in reading? School library programs in boys’ schools have a unique potential to transform boys’ enthusiasm for and skills in reading. The participants in this IBSC Action Research project investigated how to engage boys in reading by enhancing school library activities and programs. The research literature is rich on the central role that school libraries and their professional staff play in the enriching of learning and teaching. Evidence, however, that programs/activities initiated by school libraries enrich boys’ engagement and motivation to read, is limited. With this in mind, the action researchers have explored a variety of reading interventions that have led to enhanced reading experiences in boys from Kindergarten through to Year 12.
Review the Action Research Library projects. How can we create and deepen meaningful and authentic leadership opportunities for boys in our schools? Leadership is a key focus and goal for character education in boys’ schools, and in recent years many schools have revamped or are engaged in re-thinking their leadership programs. “Leadership” is a changing and complex concept. And it can be challenging to measure success and impact on boys’ leadership growth and on the school. This Action Research team on Boys and Leadership. investigated leadership in several areas of school life: academic, sports, prefect programs, peer mentoring and house systems. The central question all researchers have explored is: How can we create and deepen meaningful and authentic leadership opportunities for boys in our schools? The programs investigated and honed during the action research process aspire to: reflect best practice about boys' learning and development; be developmentally appropriate; offer and support 'authentic' learning activities; be sustainable; be measurable in terms of their success in aligning to the stated objectives; be integrated into the day-to-day fabric of the school; offer some form of recognition of accomplishments; have broad faculty support and 'buy in'; inspire boys to discover and develop their leadership attitudes and skills; involve students in their design and on-going monitoring. Team members reported at the 18th IBSC Annual Conference in London. July, 2011.